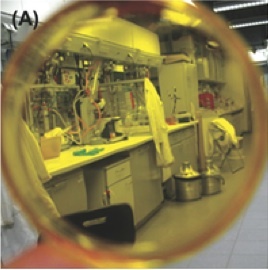 Transparent, ion-conducting, and flexible ionogels based on the room temperature ionic liquid (IL) 1-butyl-3-methylimidazolium bis(trifluoromethane sulfonyl)imide [Bmim][N(Tf)2], the dye-IL (DIL) 1-butyl-3-methylimidazolium methyl orange [Bmim][MO], and poly(methylmethacrylate) (PMMA) are prepared. Upon IL incorporation the thermal stability of the PMMA matrix significantly increases from 220 to 280 °C. The ionogels have a relatively high ionic conductivity of 10−4 S cm−1 at 373 K. Most importantly, the ionogels exhibit a strong and reversible color change when exposed to aqueous or organic solutions containing protons or hydroxide ions. The resulting material is thus a prototype of soft multifunctional matter featuring ionic conductivity, easy processability, response to changes in the environment, and a strong readout signal, the color change, that could be used in optical data storage or environmental sensing.